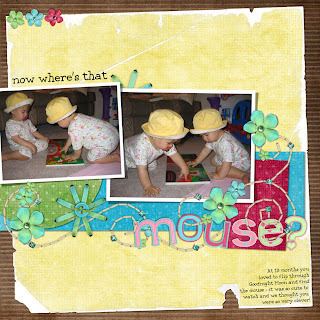 My Scrappin' Evolution: Now Where's That Mouse? I've had these photos in my stack of photos to scrap for a long time - I started a LO yesterday and got one finished, but wasn't happy so I threw it all away today and started over. I'm happier with the second LO, but it could still use a little something. I realize that I don't have much yellow in my digistash - and much less yellow with reds, blues & greens. I loved these little jumpers on the girls and they were in a stage where they would wear a hat pretty much all day inside - it didn't last long though, by the time we were spending more time outdoors they didn't want one anymore. I tried to stick with one kit - so some recoloring and blending to make some of the colors pop just a bit more. Like I said - it still doesn't feel "right", but I'm still trying to ramp up my scrapping mojo again. I haven't been keeping up with all the blogs & freebies like I was before, and heavens knows I haven't taken a minute to think about creating a new kit. i just LOVE this page, sarah!! it looks sooo adorable!